so I have managed to fix a major portion of the Websend plugin just now with the help of some people over at the spigot forum. What was fixed was the main communication between the website and minecraft, so now we can run minecraft commands again from the website. So announcements about new website posts but also the scheduled darkland changes etc seem to work fine again. If you are online in the game and some commands do not work (apart from shop/deposit) please comment on the latest update progress post here on the website! Good news is that I made some progress in getting the store/deposit back to work. I was able to create a preliminary list of items that need to be updated due to changes from 1.12 to 1.13. There are some items that are not automatically assignable for the conversion of 82 items. In order to shorten that list I will run that 82 item list against the actual database to find the items that are actually present in the system and then write a manual block conversion list for the leftovers. Bad news is that Websend seems to be broken in much moreplaces than previously thought. 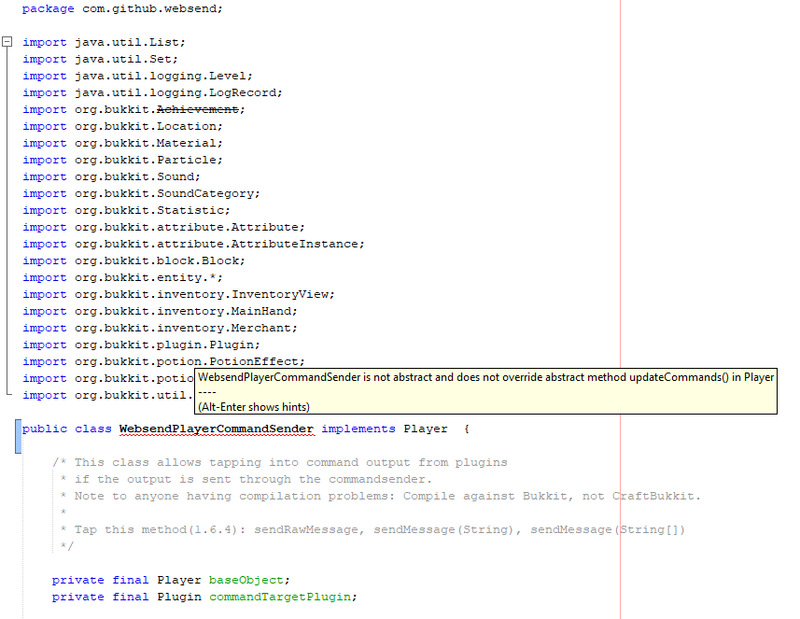 This is extremely frustrating since my Java knowledge and my knowledge about this plugin is just miserable. So all I do takes 10x longer than with the stuff I wrote myself. Right now I managed to find out how to add much more detailed debug info into Websend so that I can track down better where errors are generated. This has led me to this issue here. I hope that someone at spigot can help me how to solve this. If you know any Java, please look into the above issue. I can use any help I can get. So I made a lot of progress behind the scenes to make sure we are up and running properly with 1.13. I managed to figure out how to build websend properly with all updated dependencies and without it being 40MB large. This is some java technicalities but it’s quite important in order to be able to work on plugins and to keep them up to date in the future. As a consequence, I was able to simplify the code in the websend plugin a bit as well. This removed some unnecessary error messages. The next step will be to convert the stock & deposit to 1.13 blocks without losing anything. I will have to find a safe way to do it since it will be quite hard to find out if I messed up something in a subtle way. I hope I can make some progress there today. Ok, so I managed to get the shop up and running. Luckily I found some new resources some weeks ago which allow us to generate the list of all available items automatically from an external source. The tricky part is now that there are tons of items still in the store with the old format that need to be updated. Withdrawing these items will returns the wrong stuff to you. Therefore I first have to write an update process for these items before we can re-enable to the store and deposit. Still, all I have to do now is write a transfer-code and then we can re-enable the store again. This might be happening within the next 12-18 hours. I am not sure if I can re-enable voting until then. So there are good news, but we are not there yet. I have managed to get the server running now, but there are still inconsistencies in the item names from 1.12 to 1.13. So shop and deposit as well as voting is off now. I have figure out how to fix these (except voting, there seem to be additional complexities), I still need to do so however. Once that is done, we can enable shop & deposit, but I have seen other errors of currently unknown source that I need to identify and fix as well. The whole thing might be a bit complicated and last for a couple of days until all is back to normal. I would recommend everyone to just stick to the temp server right now as the main server will have frequent reboots without warnings for the time being. The remaining bugs might further affect game consistency. Websend fix progress, no success yet. I am working right now on trying to upgrade websend to 1.13.x but I am running into issues with the compiler. If you want to help, please take a look at the Java source: https://github.com/uncovery/Websend and let me know if you are able to make it run. Let me know if you have an idea how to resolve this. So I did the first upgrade test and realized that Websend breaks as soon as someone has an enchanted item in the inventory. I am checking right now if I can fix this on the quick, otherwise we have to go back to 1.12 for a while. Main server remains down for the time being, will report back with the progress. This means that I would take a backup of the current server and upgrade it to 1.13.2, try again with full plugin configurations. If that works as well, we are ready to upgrade. Right now, I am quite positive that this will work nicely. Just to keep everyone up to date, I wanted to let you know that the Spigot software that runs our server has now reached a development status where no more serious issues with world conversions are to be expected. This means that we can start testing upgrading the server. The current running server will be so far unaffected. I will be basically making a copy of the server, test the new spigot version and see what breaks. Once I have a list of plugins/code that needs to be updated, we will work through it and then prepare for the main server upgrade. I hope that we will see the actual upgrade sometime in November. the temp server is running at a very very high CPU load. Please make sure that you don’t overdo it with farms, redstone etc. The same rules as for the main server are valid for the temp server. Just the fact that we don’t have plugins to prevent you from doing excessive stuff, does not mean it’s allowed. If I need to go around to find laggy stuff, I won’t hesitate to just reset the whole area. If I find out who did it, bans might happen as well. So please be considerate of the other folks on the server and stick to the rules! As reported before, the map format of minecraft changed considerably with 1.13. This broke the tool that we use to reset lots. As you can imagine, the ability to reset lots is one of the core functionalities of this server. Other servers provide only flatlands-style lots to users. On the contrary, we have always provided users with real-world lots in the empire and kingdom with the option to reset it when a new user comes in. This functionality is a key component of the “vanilla-style” immersion of the server and the preservation of a natural looking environment was always a key driver for the server look & feel. So since 1.13 was breaking the tool that we were using from the start to accomplish this feature, I was on the lookout for people who would be able to help us to port the tool to 1.13. Unfortunately, despite many, many people who had done small steps in continuing to develop the tool in the early days (2015…), there was only one person making recent contributions to it. I contacted that person and luckily got a fast reply, but in the end this person did not work on the recent changes (yet). So I gave up to look for current editors and returned to contact Azkedar, the user who helped us so kindly to originally extend the external tool to dramatically simplify the lot reset process. Azkedar was so kind to immediately respond to my query and essentially come back within no less than 50 hours with a new, working version of the tool that enables us to reset lots in 1.13. I cannot thank him enough for the fast contribution to this issue. Without this, we would be stuck in 1.12 for the time being. And while, yes, there are even today servers that are stuck on version 1.8, I always took pride and a lot of effort in keeping up with recent versions and attracting users with the latest features instead of hoping that people would somehow not think that new blocks are important for the sake of sticking to the same server. So in other words, as soon as Spigot gets upgraded reliably to 1.13, we are good to go along for the most important parts of the server functionality. We will still have to see if Websend (used for the majority of user commands) is any issue, but the base server mechanics will continue working! Spigot might have a stable version in the next 2-3 weeks as per estimates. No news on the lot reset process yet. This is key, I will try to find alternative tools here in the meantime or fix the current one. Dear all, we just upgraded the server from 1.13 to 1.13.1! Please make sure that you upgrade your client in case you cannot connect. Hey all, I have done some more work to check into the 1.13 upgrade and wanted to update you on the status. So first of all, FYI, the chunk/nbt format has been changed dramatically. That’s the data format used to store any and all information of the minecraft worlds. So any and all tools and plugins that change or read that data will break with 1.13 the one or other way. Now for the 2D map, there is good news, there are already now people working on fixing this, which is great. For the tool to reset lots, the news is not so good. The original tool that was the base for what we are using right now, has not been touched by the original author since 7 years. We had “Azkedar”, one of our former members write an extension to that tool to allow us to easily copy lots in 2014, so 4 years ago but Azkedar has not been around for some years. However, I found someone who updated that original tool just some 2 months ago. I have contacted that person today to check if they plan to update it to 1.13 as well. So we can hope that this is the case, and if yes, that Azkedar’s extension will work with the updated tool without modification. Otherwise we will have to get in contact with Azkedar as well to see if he would be so kind to update the extension as well. If that does not work, I am afraid, we would have to find a completely new way to reset lots, which might be difficult. There seem to be methods for a plugin to do that, but that would have to be programmed first and we would have to have the mint worlds loaded in-game as well. I am not sure what that means for server performance if we suddenly need to keep 2x the amount of worlds loaded. At the minimum, we have to refrain from lot resets and have to move to lot regeneration, which means that the lots would always be updated/reset to the current render standard, which in return would mean that every deserted lot in the kingdom would automatically become a 1.13+ lot, with all the potential disruptions to the surface continuity along with it. If all else fails, we would be stuck with 1.12. Considering that there are a lot of servers that are stuck with 1.8, this is not a total disaster, but still not really desirable for anyone. So if by chance you know how to program C and can help to update this tool to 1.13, please help us all to keep updating the server!